For the purposes of this course, we can use a simple model of matter as substances and interactions, and of atoms as positively charged nuclei composed of protons and neutrons, surrounded by orbital electrons. When the central part of the atom (the nucleus) is unstable, a nuclear transformation takes place. As a result of this transformation, a new nucleus is obtained, usually in an excited energy state. Very often, one or more particles are emitted. Depending on the particle emitted, we can have alpha radioactivity, beta radioactivity, neutron emission, etc. De-excitation of the excited nuclei can also result in the emission of electromagnetic energy, called gamma radioactivity, or other forms of radioactivity. When a substance contains unstable nuclei exceeding a certain concentration limit, it may be called: radioactive material, prescribed radioactive substance, nuclear substance or radioactive nuclear substance. In this course, such a substance will be referred to as radioactive material. Possession, use, storage, transportation, and disposal of radioactive materials are regulated at the international, federal, provincial, and municipal level. The University of Toronto radiation protection program satisfies these regulations and provides for further protection. We can define radioactivity as a process of nuclear transformation, resulting in a new nucleus and the emission of particles and/or electromagnetic energy from the nucleus. Alpha radioactivity consists of the emission of a particle containing 2 protons and 2 neutrons (i.e., a Helium nucleus), usually from heavy nuclei such as uranium, thorium, radium, etc. The progeny nucleus will be situated 2 places to the left of the parent in the periodic table, and it’s atomic weight number will be 4 units less than that of the parent. Alpha emission is often followed by the de-excitation of the resulting excited nucleus through gamma emissions. Alpha particles are mono-energetic, with energies around 5 MeV. The actual energy of the alpha particle is particular to the specific nucleus. Alpha particles interact very strongly with matter. A sheet of paper, the first layer of skin (epidermis), or a few centimetres of air can easily stop them. Consequently, there is no concern for external irradiation of people from alpha sources. However, when gamma radiation is emitted together with alpha particles, precautions against external irradiation caused by gamma rays should be taken. If ingested or inhaled, alpha emitting radioactive material interacts with the surrounding internal tissues. All of their energy is absorbed inside the body, potentially causing damage to the cells. Due to the internal irradiation hazard from alphas, special precautions are taken when handling open sources of alpha emitting radionuclides. Unlike alpha radioactivity, which is common only to heavy nuclei, beta radioactivity can be encountered at all nucleus sizes. It consists of emissions from the nucleus of light particles. When a neutron rich nucleus is unstable, it emits a negative beta particle (an electron) and an electron antineutrino (a particle without rest mass, similar to a quantum of light). When a proton rich nucleus is unstable, it emits a positive beta particle (called a positron, having the same mass as an electron but a positive electrical charge) and an electron neutrino (also a mass-less particle). Sometimes the new nucleus (situated to the right in the periodic table for negative beta radioactivity and to the left for positive beta radioactivity) is in an excited energy state. De-excitation can be accomplished through the emission of one or more gamma rays. Because beta particles share their energy with their respective neutrino, the beta energy spectrum is continuous (i.e., not mono-energetic). 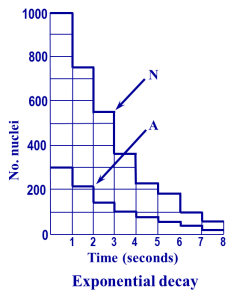 Beta particle energies vary between zero and a maximum value, which is specific to the beta emitting radionuclide. Interaction of beta particles with matter is a function of beta energy. Because of the continuous energy distribution, we can only talk of a maximum beta range in different materials. This maximum beta range depends on the specific beta emitting radionuclide. For example H-3 (also called tritium) has a weak maximum beta energy (18.6 keV) with a maximum range in air of 6 mm. On the other hand, P-32 has a strong maximum beta energy (1709 keV) with a maximum range in air of 7.9 m.
When electrons are stopped in matter, continuous emission of electromagnetic energy is produced (called bremsstrahlung). This energy is in the range of X-rays (lower energy than gamma rays) and becomes more energetic if the stopping material (shielding) is made of heavy materials such as lead. This is the reason why protection from beta particles is provided by light materials such as Plexiglas. When gamma emission follows beta disintegration, protection against gamma rays is also required. In this situation, we need to stop the beta particles first with light material and then gamma and bremsstrahlung radiation with heavy material (lead or other metal). An alternative way of dealing with the instability of proton rich nuclei is electron capture (EC) radioactivity. In this kind of radioactivity, an electron from the closest shell (usually K-shell) is absorbed into the nucleus and reacts with a proton. This causes the formation of a new nucleus situated one place to the left in the periodic table . The new nucleus can be in an excited state and the de-excitation can be done through the emission of gamma rays. The re-arrangement of electrons in the atom (electrons move from upper shells into the empty place on the lower shell) results in the emission of X-rays. Shielding of EC radioactivity is the same as in the case of gamma or X-rays emission. Gamma rays are mono-energetic electromagnetic rays emitted from an excited nucleus, the result of a previous nuclear transformation. The gamma emissions are characteristic of that particular nucleus. The gamma ray energy of different nuclei varies between tens of keV (this is the range of X-rays) and tens or more MeV (this is the range of cosmic radiation). Their interaction with matter is weak. The absorption of gamma rays obeys an exponential law. Protection against gamma rays (as well as against X-rays) can be obtained with heavy materials (lead or other metals), as well as with large enough quantities of concrete or any other materials. For example, our atmosphere (a huge layer of air) protects us against strong cosmic radiation coming from outer space. Neutrons can be produced during fission or fusion and during nuclear reactions. In nature, there are few heavy nuclei capable of spontaneous fission (splitting of nuclei in usually two lighter parts, a process accompanied by emission of a few neutrons). Several nuclear reactions produce neutrons. Usually, neutron sources are a combination of a heavy nucleus and beryllium (Pu-Be, Ra-Be, Am-Be, Po-Be, etc.). The alpha particles produced by the heavy nucleus interact with the Be-9 nucleus, resulting in a C-12 nucleus and a neutron. There are several neutron sources at U of T. Protection against neutron sources is obtained with water and concrete. 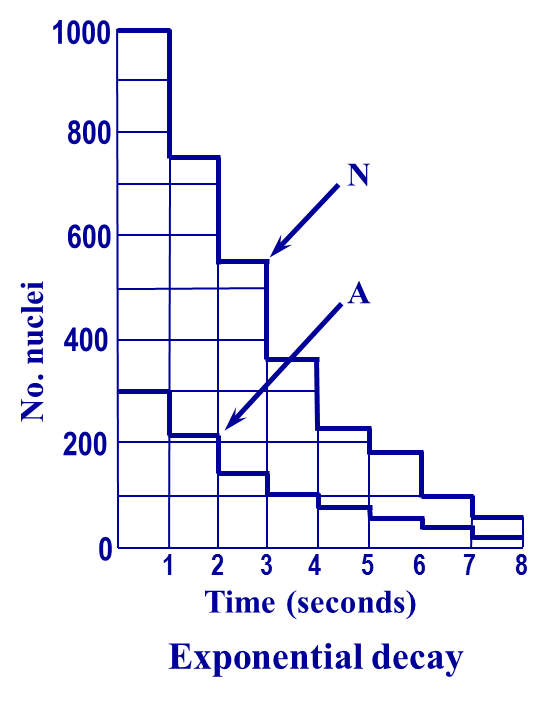 where N(0) is the initial number of unstable nuclei of a certain species, and l is the disintegration constant, which depends on the particular unstable species. The unit of measure for activity, in SI, is disintegrations per second. To honour the discoverer of radioactivity (Henri Becquerel, 1896), the unit of activity (disintegrations per second) was named the Becquerel and the notation used is Bq . Historically, another unit was used – curie – noted Ci . It was named after Pierre and Marie Curie. One curie (or 1 Ci) is the activity of 1 gram of pure Radium. This activity is equal to 3.7×1010 disintegrations per second, or 3.7×1010 Bq. Usually, radionuclide tables give the value for T 1/2 . * This is 8 times less that the initial purchased activity. Therefore, it is better to order the radionuclide as close as possible to the date of use. As a result of interactions between different kinds of radiation with substances, ionization of atoms can result. Hence, the use of the term ‘ionizing radiation’. The excitation of atoms, molecules, or breaking of molecular bonds can also occur, causing potential damage to the cells. Slowly, the energy of radiation gets deposited inside the material. Dose is a measure of the energy deposited inside cells, organs, or body. To measure the energy deposited by all types of ionizing radiation, in all materials, a term called absorbed dose is used. This term measures the energy deposited by the radiation in one kg of substance. The SI unit of measure is J/kg, which is also called the gray (Gy) . Historically a smaller unit was used, called the rad (radiation absorbed dose) . When the source of irradiation is situated outside the human body, the dose is called the external dose. When the source of irradiation is inside our body, the equivalent dose is called the internal dose. There are a large number of sources of ionising radiation in the natural environment, around us and inside us. The dose received from these types of sources is called the natural dose, or background. Natural dose varies around the world by more than a factor of ten. This variation is due to the differences in the composition of soil and materials used for building our houses, the composition of food and water, the altitude etc. The higher the altitude, the larger the irradiation from cosmic sources. The main contribution to our naturally occurring dose (over 50%) comes from inhalation of radioactive Radon gas products found in the air we breathe. Another important contributor to the internal radiation we receive is from K-40 inside our bodies. In North America, the natural dose varies between 2 and 3 mSv (200 and 300 mrem) per year. The total dose received by an average person in North America is in fact bigger than the amount shown above. This is due to artificially produced radiation and it is called the artificial dose. The main artificial dose in North America comes from X-ray machines used in medical diagnoses. Federal regulations impose a limit to the total artificial dose received from sources other than medical purposes. This value was established at 1 mSv (100 mrem) per year for members of the public. There are two types of biological effects of radiation. One is acute, where the amount of damage is proportional to the value of the dose equivalent received by the person. These effects typically relate to high dose levels. This type of biological damage is called a non-stochastic effect of radiation. Sometimes, when controlled, this type of effect may be beneficial to our health. For instance, some forms of cancer therapy utilise high doses of radiation to kill cancerous cells. In our university, large doses causing acute effects are not commonly encountered. The second types of effects are delayed and statistical (or stochastic) effects. These effects are related to intermediate and low-level doses received by a person. There is no dose-response relationship. The dose relates to a statistical probability of developing a certain effect. The best example is cancer. Exposure to a certain dose can increase the risk of developing cancer. With respect to the foetus, if the dose was received in the first two months of gestation, mental retardation may occur in the offspring. Radiation is one of the best known carcinogens. Since the last half of the 20th century, our knowledge of this type of cancer has increased dramatically. A statistical proportionality between the level of dose received by a large number of people and the expected effects was proven at a high-to-intermediate level of dose equivalent. Only at much higher doses than those encountered at the University is there a statistical proportionality between cause and effect. A linear extrapolation of this data has been made to low and very low levels of dose equivalent. However, this linear extrapolation method has not been proven scientifically. Conversely, some studies show that low levels of irradiation are in fact beneficial to our health. However, in the absence of scientific consensus, the regulators adopted a conservative approach and consider all levels of radiation as being damaging to the human body. Because of this, any procedure that involves radioactive materials must abide by a principle called ALARA, keeping all doses ‘As Low As Reasonably Achievable’. ALARA implies that doses received by workers with radioactive materials should be as low as reasonably achievable. Although the principles of ALARA are inherently conservative, it is still necessary to set limits. They are established at a level of risk that is considered acceptable for public health. This is the level at which stochastic effects cannot be distinguished from their natural occurrence (e.g., cancer) in modern society. This is the philosophy that the University of Toronto has adopted. This can be acieved through training, good work practices, and by implementing strict procedures in every aspect of work involving radioactive materials. At U of T, the level of additional dose received by students, staff, or faculty members are kept to levels lower than required by law. By using methods that will be explained later, we determine dose levels received by persons working with radioactive materials. The administrative action levels are established at levels lower than the federal requirements. When the dose received by anyone working with radiation approaches these levels, the U of T Radiation Protection Service performs a careful examination of each particular case. Two types of methods are used to measure external dose. One consists of using instruments such as survey meters, surface contamination meters, and neutron detectors. These instruments comprise the gas filled detectors (Geiger-Müller or proportional detectors), the scintillation detectors, and some special detectors for neutrons. Check first if the right method (direct or indirect monitoring) is required for the type of radionuclide used. Check if the instrument has been calibrated less that a year ago (check the sticker on your instrument) ensure that the battery and HV (when there are available) indicators are in the correct range. Measure the background before reading the values in the work area. Subtract the background after taking readings in the work area. With the remaining number and the instrument’s efficiency for that particular radionuclide (see sticker), estimate the level of contamination. Take the necessary actions to reduce the contamination below the set limits. The second method for measuring external dose is personal dosimetry. This consists of whole body Thermoluminescent Dosimeters (TLDs), extremity TLDs, and neutron dosimeters. The TLDs are contracted with a licensed company and the dose is measured every three months. The results are reported to the RPS and to the Health Canada. After checking each report and comparing it to the administrative action levels, the RPS sends the results to the workers. These dose measurement results are strictly confidential. With respect to internal dosimetry, U of T performs two types of bioassays. A baseline measurement for each person starting the usage of sufficiently large quantities of radioactive Iodine, Tritium, or other radionuclides is performed before starting the work. This measurement is important as a reference, but will not be used as a substitute for background of our measurements. The first type of bioassay is dedicated to Iodine users (I-131 and I-125) and consists of measuring the concentration of radioactive Iodine in the thyroid. This measurement must be performed shortly after the time of use, but not later than 4 days post-usage. 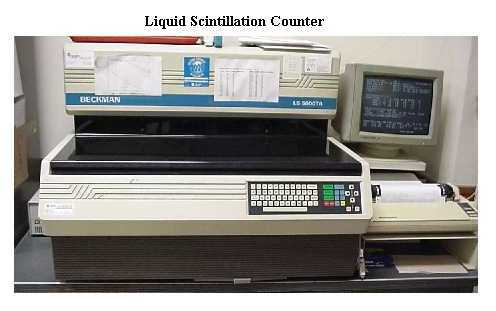 The second type of bioassay is urinalysis. Because most radionuclides used at U of T can be detected in body fluids, this is a very good method to check for possible ingestion or inhalation of various radionuclides. Urinalysis is performed shortly after usage of radionuclides, but no later than 4 days post-usage. If radionuclides are discovered in someone’s body, an estimate of the inhaled or ingested quantity is performed, and compared with the Annual Limit on Intake (ALI) for that particular radionuclide. Immediate action is taken to stop the intake by analysing the work practices, changing the work procedures, etc. Once someone decides to include radioactive materials in his/her research, he/she must apply for a radioisotope permit. During the process of obtaining the permit, the radionuclide work procedures will be examined together with other aspects such as the applicant’s training, previous work experience with radioactive materials, adequacy of workplace facilities and preparation, dosimeters used, protective equipment, etc. As explained earlier, it is better to order radioactive materials only when they are needed or as close as possible to the date of the experiment from both an economic and ALARA perspective. This will also reduce the risks associated with long-term storage, source leakage, external irradiation, etc. Reduce the time spend working with radioactive materials as much as possible. A good work practice is to perform the experiment without radioactive material first, to get used to the procedures, and perform the first experiment (if possible) with the smallest amount of radioactive material that will give a readable result. After becoming familiar with the procedures and safe handling of these materials, the quantities used can be increased. The second method involves increasing the distance between the body and radioactive materials. Always store radioactive materials and radioactive waste far from other working areas and/or offices. What if the procedure requires working with radioactive materials close to the body? Whenever possible, especially for strong beta and gamma emitters, use tools. Don’t touch the materials with hands unless strictly necessary. However, if hand contact cannot be avoided, manipulation of the materials with gloved hands is required. Most work with radioactive materials at the University will require that the user be quite close to the material. Therefore, working behind shielding is recommended. As explained earlier, different kinds of shielding must be used for different radionuclides. No shielding is required for pure alpha or pure low energy beta emitters. Plexiglass shielding is required for beta emitters, heavy metal (such as lead) for gamma or X-rays, water, and wax or concrete for neutrons. Large enough layers of air, water, or concrete can protect the human body from all types of radiation. Always check the effectiveness of the shielding before starting an experiment. Analytical X-ray machines produce intense beams of ionizing radiation that are used for diffraction and fluorescence studies. As stated earlier, X-rays can be characteristic (especially from K shell emission of the target material) or continuous (also called bremsstrahlung). X-ray machines may be hazardous because of their potential for producing high radiation fields. Special attention should be paid to the central beam but secondary emissions from samples, shielding materials and fluorescent screens should also be considered. The shielding, safety equipment, and safety procedures prescribed for X-ray diffraction equipment are applicable only for up to 75 kV-peak X-rays. Additional precautions are necessary for machines operating at higher voltage (such as interlock systems). The supervisor is responsible for providing a safe working environment by ensuring that all equipment is operationally safe and that users understand safety and operating procedures. Do not put any part of the body into the X-ray beam. Use safety glasses or prescription glasses to protect eyes from secondary exposure (glasses can not protect eyes from direct exposure). As stated earlier, the possession, storage, use and disposal of radioactive materials is highly regulated at the international, federal, provincial, municipal, and local (U of T) levels. In Canada, the federal body invested by the Canadian government with regulatory powers for all aspects of radiation safety is the Canadian Nuclear Safety Commission (CNSC) . The Commission exercises control over radioactive materials through the tenets of the Nuclear Safety and Control Act and enforces its mandate through licence report submissions and regular inspections and evaluations of radiation protection programs. Starting with July 2013 the CNSC can issue Administrative Monetary Penalties AMPs). Depends on the gravity of non-compliance the AMPS can be between $300 and $25,000 for a person or between $1,000 and $100,000 for the institution (per penalty per day). Other federal and provincial agencies are involved in control of radioactive materials such as: Transport Canada, Health Canada, Environment Canada, Ontario Ministry of Health, Ontario Ministry of Labour. U of T has a consolidated Nuclear Substances and Radiation Devices Licence for the use of radioactive materials. This type of licence allows for the considerable flexibility required at a dynamic centre such as U of T. This requires U of T to maintain a well-managed and documented radiation protection program to ensure that radioactive materials are used safely. The U of T Governing Council has delegated the responsibility of governing the safe use of radioactive materials to the University of Toronto Radiation Protection Authority . The UTRPA is responsible for all aspects of radiation safety at U of T and has the power to enforce and set standards through policies, inspections, and disciplinary action if necessary. The UTRPA, through the Radiation Protection Service (RPS) issues, administers, reviews, and amends permits. The Radiation Protection Service executes the mandate of the UTRPA by maintaining daily operation of the radiation protection program. Internal radioisotope permits are issued within the U of T in order to control the use of radioactive materials at the University. A comprehensive list of duties and responsibilities of the UTRPA , RPS , permit holders , and radioisotope users has been established. A number of radiation safety policies have been developed and adopted by the UTRPA. Training is considered the first important step in radiation safety. All radioisotope users must have either U of T radiation safety training or equivalent, which must be recognised by the RPS. One-hour administrative training is required for all users, including those with equivalent radiation training. When applying for a new user’s TLD, the permit holder must sign the application and send it to the RPS. A Radiation Safety Officer will check if the new radioisotope user was trained or will contact the new user to arrange for radiation training. At the end of the course, the applicant must pass a written examination. Upon successful completion of the course and examination, a Radiation Safety Officer will administer a short oral quiz in the laboratory where the radioisotope work is being conducted, before providing a radiation course certificate. A comprehensive set of procedures and standards for radiation safety has been developed and maintained by the RPS. There are procedures for ordering, receiving and transferring of radioactive materials , both from outside and within U of T. Special procedures have also been developed for the disposal of radioactive materials . Procedures and checklists are established for commissioning a new radioactive laboratory. Laboratories are classified as basic, intermediate or high depending on the amount and type of radioactive materials to be used. During commissioning, radiation signs and labels are posted inside the laboratory. Depending on the type of laboratory, special security may be required. Radioactive materials should always be kept locked to prevent access by unauthorised persons. Strict record keeping of received, stored, used, and disposed radioactive materials, as well as contamination monitoring , is also required. These records must be available for the last three years of radioactive use in the laboratory. To prevent any accidental ingestion of radioactive materials, food and beverages are strictly prohibited inside the radioactive laboratories. After performing experiments with radioactive materials, contamination monitoring must be performed by each user. Results of the monitoring must be recorded and made available to the RPS Radiation Safety Officer and/or CNSC inspectors. A special procedure is required for checking sealed sources with activities greater than 1.35 mCi (50 MBq). Also, decommissioning of radioactive labs or instruments with radioactive sources is performed according to special procedures (See Module 9, Sections: 9.4.10 , 9.4.12 and 9.4.13 ). The University of Toronto has a large number of instruments producing X-rays used for research, as well as for medical purposes. According to Canadian laws and regulations, these instruments must be registered with the Ontario Ministry of Labour and/or the Ministry of Health. During the course of normal operations with radioactive materials, a spill can occur resulting in contamination of personnel or lab equipment and areas. Also, external irradiation can be encountered from a strong gamma or neutron source left unshielded. Appropriate actions must be taken during such incidents to prevent unnecessary doses to personnel and further spread of contamination. In case of serious injury, medical attention takes precedence over radiological or other concerns. Dial 416-978-2028 or the Campus Police immediately and inform U of T RPS or Campus Police about the incident, injury, and that radioactive materials are involved. Alert everyone in the area and take all reasonable precautions to limit the spread of radioactive contamination or further exposures. Never risk external or internal contamination to save equipment or an experiment. In case of a radioactive spill, contact RPS immediately if more than 100 EQ are spilled on a bench, floor, equipment or on a person, spill of volatile material, if internal irradiation (inhalation/ingestion of radioactive material) is suspected, if excessive external dose is suspected, if contamination of personnel is suspected, or in the case of contamination of large areas. In this case, besides the general emergency procedures listed above follow the radioactive spill instructions. In any clean-up of a radioactive spill, always clean the area until measurements indicate that the contamination is below the contamination limits before removing radioactive warning signs. If there is any questions of the effectiveness of the spill clean up, contact the RPS or U of T Campus Police. In case of an emergency involving strong gamma or neutron sources, evacuate the area and contact the U of T RPS or Campus Police. Determine the limits of the area with dose rates above 2.5 µSv/hr (0.25 mrem/hr). Restrict access to that area by using radioactive signs and/or tape, closing the doors, etc. Guard the area until RPS/U of T Police representatives arrive. In case of emergencies involving radiation-producing machines (X-ray), turn off the machine and unplug or shut off the circuit breaker for the machine. In the case of injury to personnel, call 416-978-2028 or the U of T Campus Police, notify the laboratory supervisor, and record all information about the incident (eg. operating voltage and current, exposure time, distance from radiation source).